Totally redefines business and work! A brilliant collection of business perspectives! A superb read and one that will make you look at business in a whole new different light. 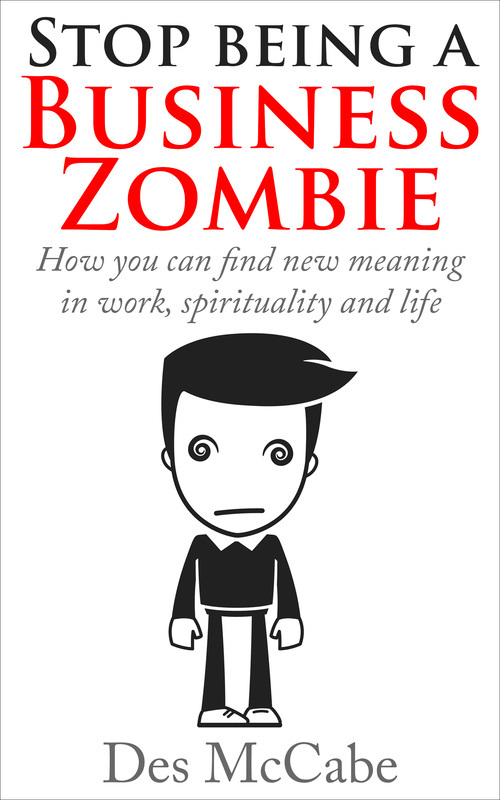 ‘Stop Being A Business Zombie – How you can find new meaning in work, spirituality and life.’ – takes familiar business terms such as time management, personal development and team building and gives us a totally different perspective on each. This truly refreshing approach will lift you above a traditional business mind-set by offering new linkages and fresh insights. Thoughtful, challenging and inspiring, each of the ‘new definitions’ takes you in a direction least expected and along a path that engages you – helping you to generate additional ideas and find new meaning in common everyday situations so that you can become truly happy with your work-life balance. In many ways this is the alternative management book. No matter what business or profession you are in this is essential reading for all – breaking new ground with a clarity reminiscent of the best of business writers such as Malcolm Gladwell, Anthony Robbins, Stephen Covey, Dale Carnegie or Brian Tracy. 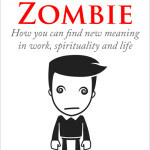 ‘Stop Being A Business Zombie – How you can find new meaning in work, spirituality and life.’ suggests that the old corporate world of greed can be replaced by a kinder, more compassionate and indeed more effective framework – one that supports all of us, promotes new opportunities and drives success for all. Hitting Targets — Case Study — Photocopying — Click and Collect — Self-Development — Currency Flipping — Stationery — Successful — All inclusive — Business Partners — Asset Management — Sole Trader — Annual Performance Review — Memo — Quantitative Easing — Business Appraisal — Re-inventing the Wheel — Kindness Policy — Mystery Shopper — Terms of Reference — The Cloud — Product Life Cycle — Leadership — The Bottom Line — Breakfast Briefing — Bespoke Toolbar — Paradigm Shift — Profits — Money Laundering — Reboot — Diversifying — Cash Flow — Business Development — Joint Venture — To Do List — Team Building Exercise (Monkey Puzzle) — Exchange Rates — Time Management — The Plan — Curriculum Vitae — Outward Bound — Time Saving Technology — Equality at Work — Google Maps — Disciplinary Procedure — Outplacement — Return on Investment — Interior Design — Thinking Outside The Box — Re-branding. This book makes you think in a completely different light about many aspects of business, reminding us that there’s more to life than work. Life comprises both personal and work time and Des McCabe’s reflections made me consider how they are more closely interlinked than may be immediately obvious, and how lessons from each sphere translate to the other. Easy and quick to read first-time, but it should be revisited regularly for maximum benefit. This is a great take on business sayings and really lets you focus in a fun way about spirituality and business and how they can both easily interact – loved the comparison of the three gifts from the Wise Men and how we were given at least 3 gifts – great confidence builder!. I would highly recommend this book to anyone who loves to pick up and set down a book and for those of you who want to be inspired in a relaxed and novel way! This book is a little gem to be savoured and dipped into often, especially in times of stress and pressure. Des McCabe opens the windows and blows away the perceived wisdom of what businesses and people should aspire to and deem successful. His “Time Saving Technology” in which he points out how we can add 10 to 15% extra time to our lives is only one of the many priceless pearls that he has crammed into this small book. It is not just a book for business its a book for life. Very quick and easy to read – but you need toreally reflect on what you read to get the best from it! I particularly liked the kindness policy and the diversification sections they should be part of all our lives every day. Thank you for the inspiration! I am going to revisit my ‘business plan’!!!! A fantastic book. A really valuable tool to remind us to make sure we are true to our values including how to check. It reminded me to take time out and make sure I have the best perspective on all the plans that are important to me. A refreshing read. A trigger book that flashes the mind into thinking, considering and opening up to how we do things, why we do things the way we do. The written text pokes at you and says wake up! It also inspires you to be better, kinder and generous in all things. Thanks you to the Author for a great quick fire hitting read. I found the book very refreshing – thought provoking, yet simple. Des takes some of our modern jargon and gives a totally different spin on each of the subjects. No wonder this man is one of the UK’s leading experts on human resource management and workplace training. Your time is running out. Another year has gone. Your life is passing by. It is here now. The moment to grasp all that is meant to be. The whole purpose and meaning of your life. Your time is running out. Another year has gone. Your life is passing by. It is here now. The moment to grasp all that is meant to be. 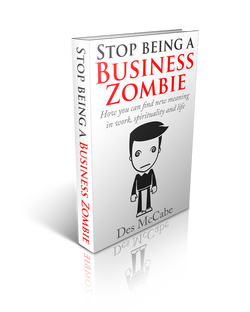 Business zombie is an insightful book containing 50 different business key terms explained in a new found spiritual and positive manner that will bring both a smile to your face, as well as providing a glimmer of fresh insight into your business, how you could possibly change your business to suit modern times, whilst also being a motivating and inspiring read for those who want to find a new meaning to both work and life in general. The book itself has an a philosophical style and novelty to it, thus making it both an enjoyable and interesting read, especially through the interesting use of analogies and wonderful examples that may initially seem unrelated, but as you read through it, you will realise that these are more than meets the eye. Overall, a wonderful book that pokes fun at business by putting a new spin to business meanings whilst being an inspiring read as well. I actually read this book in about half an hour. However, I fully intend to re-read it for a few hours more! It’s a great concept; taking in vogue business terms and giving them a whole new meaning; one that is spiritual and reflective rather than completely focused on making money and meeting targets. Spirituality in the workplace is pretty rare. So little thought is given to the feelings and emotions of both staff and customers. In many ways I think the world of business is rather ruthless. This book, via it’s pieces of short prose and reflective questions turns business on it’s head and leads us to ask if the business world is on the right path; a path that will lead to fulfilment, fun and true reward for all involved….. Personally, I think not. This is the first time that I’ve come across Des McCabe and I have already added some of his other books to my ‘Wish list’. This book probably won’t change the thinking of business leaders overnight, but I believe that the seeds of wisdom contained within it’s pages could sprout and form the basis of a new ideology. I hope so. It has certainly led me to view the terms currently popular within business circles in a whole new light, and I’m pretty sure that it will have the same effect on you. can re-energise your employees and transform your organisation.